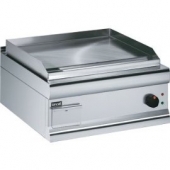 Below is additional information on the hire item "Lincat Griddle Silverlink 600 GS6". Dimensions : 162(h) x 615(w) x 400(d)mm. Cooking area : 405mm x 562mm. Output : 90 x 115g (4oz)/hr beef burgers from frozen or 55 x 225g (8oz)/hr steaks medium cooked.